The akepa is one of the smallest of the honeycreepers. It is a finch-like bird about ten centimeters in length. Adult males have a brilliant red-orange plumage with dusky wings and tail. Females have dull grayish-green plumage with a yellow-orange tinged belly. Their bills are conical and straw-yellow in color. 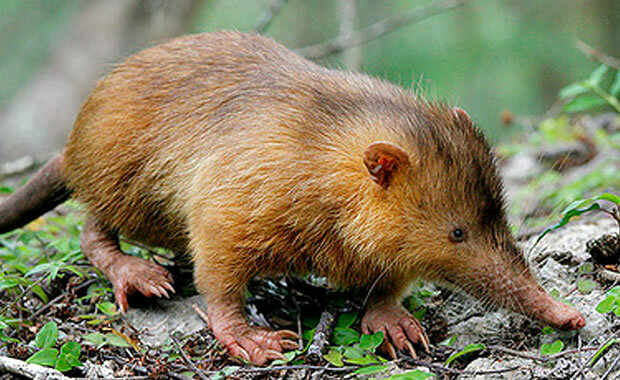 The akepa prefers wet and mesic forest primarily above 3000 feet as its habitat. They like to move in small flocks and nest in tree cavities. Akepas eat mostly insects and spiders. They use their conical shaped bills to pry open ohia buds, small seed pods, and galls in search of food. They have been known to drink nectar from ohia and other flowers found in their Hawaiian habitat. They have a quiet call and their songs are a short, warbling trill. Little is known about their reproductive behavior. Only three nests have been found, and all were in natural ohia or koa cavities from up to 15 meters off the ground. 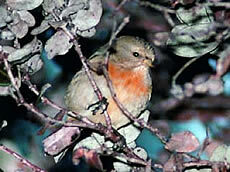 Females may lay from one to three eggs in March and the young are believed to fledge in June. The akepa was once common on the islands of Maui and Kauai, but the largest population today is only estimated at 14,000. Cause of decline is habitat loss and the introduction of aggressive plants and animals in its habitat. In an effort to save the species, the US FWS has established a refuge, the Hakalau Forest National Wildlife Refuge, for preserving the akepa and other threatened Hawaiian birds. Glenn, C. R. 2006. "Earth's Endangered Creatures - Akepa Facts" (Online). Accessed 4/25/2019 at http://earthsendangered.com/profile.asp?sp=520&ID=7.